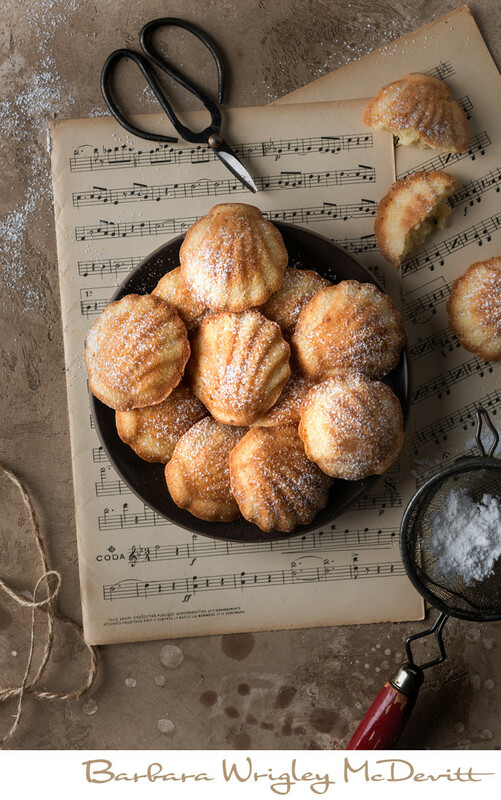 Madeleines are a French tea cake, although called a cookie by most people. They are instantly recognizable with a scalloped shell shape on one side, and a hump on the other due to the rising of the cookie in the oven. Molds for cooking madeleines are available on-line and in most stores carrying baking equipment. These buttery sponge cakes have wonderfully crisp edges and such a moist and tender crumb that they are best eaten right away. However, they freeze well, defrost quickly and can be kept for about three months in the freezer making them the ideal dish to store away and then quickly retrieve them when company unexpectedly stops by. A dusting of powdered sugar is really all you need, although you can also dip them in lemon curd. The recipe for madeleines is very flexible and you can add ingredients of your choice without altering the texture. These particular madeleines are made with the addition of lemon zest to the recipe giving them a very slight lemony and unique flavor.